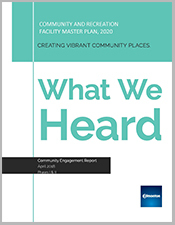 The City has developed the Approach to Community Recreation Facility Planning in Edmonton to guide investment in community recreation facilities. The Approach is the City’s overarching plan to meeting community recreation facility planning in Edmonton. 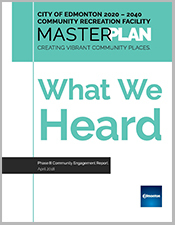 It outlines specific action related to existing or future community recreation facilities and amenities, as well as provides an overall direction to providing recreation opportunities in the city. The Approach ensures a common roadmap exists to guide decision making and other future planning activities. The Approach is based on thorough public and stakeholder engagement and research, extensive planning and documentation already in place for the City and its partners. 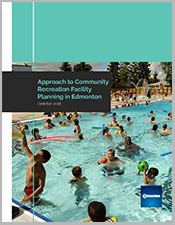 To help the City plan, provide and prioritize publicly supported community recreation amenities, The Approach includes principles, a planning method and recommendations to help guide decisions on recreation facility development in Edmonton and surrounding region. The Approach is designed to be flexible and take into account trends, demographic shifts and regional considerations. This helps the City to prepare for new demand for community recreation facilities in the future. Provides a transparent way to plan, prioritize, and provide publicly-supported community recreation amenities in Edmonton. 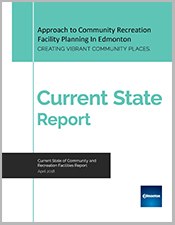 Provides insight into the current state of City provided recreation services in Edmonton as well as the broader recreational landscape in the city, region and beyond. The Public Involvement Plan outlines who we will engage and how, and ensures a range of ideas will be available throughout the design process. Feedback from the public engagement effort regarding the future of the Eastglen Leisure Centre. This report describes the final recommendations of the design team with respect to the future development of Coronation Park. The Functional Program confirms the activities to be included in the proposed renovation of the Mill Woods Recreation Centre and the facilities required to support them. This renewal project provides a long-term strategic approach to renew district parks and identify priorities for park renewal through a park master plan.